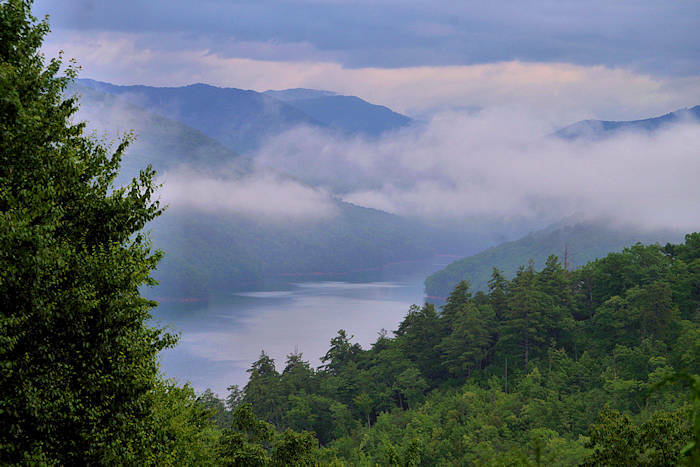 This 75-mile North Carolina Scenic Drive follows NC Highway 28 and US Highway 129 by several lakes through the Nantahala National Forest and Great Smoky Mountains. The Indian Lakes Scenic Byway takes you through the "wild west" through rural counties of Graham and Swain and the tiny town of Robbinsville, with overlooks for spectacular views of Fontana and Santeetlah Lakes. 2/10 Mile: Make a short detour on Almond Boat Park Road for a small marina with pontoon rentals, boat ramp and RV Park. 1 Mile: Cross part of Fontana Lake at the community of Almond. 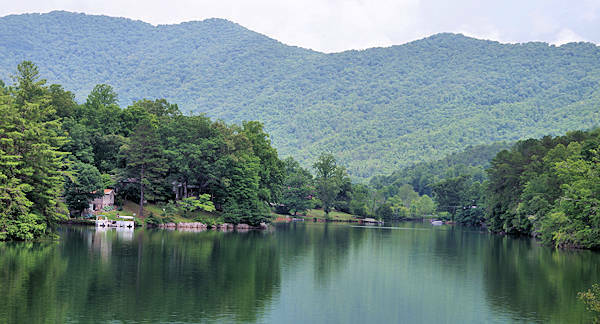 With more than 240 miles of shoreline, Fontana is unique since 90% of the land around the lake is protected since it's part of the Great Smoky Mountains National Park or Nantahala National Forest. On the left before the bridge is Fingerlake Day Use Area with one of the rare spots to access the lake. Find a small beach for swimming, picnic tables, toilet, and access for kayaks, canoes and paddleboards. On the right is Almond Boat and RV Park with pontoon rentals, boat ramp and RV Park. 8 Miles: The community of Stecoah is on the left. A must stop is the Stecoah Valley Cultural Arts Center located in the historic school made of native rock. See and buy impressive art and craft from 180 regional artists and attend their summer music series. Also, read about the history of the Cherokee Indians in the valley. 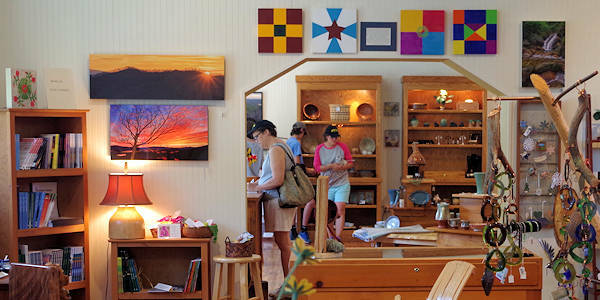 Near the center, you can also visit several artist studios. Read more about Stecoah Valley. 11 Miles: NC Highway 143 to the left is a short cut to Robbinsville, crossing the Appalachian Trail at Stecoah Gap. 21 Miles: Another must-stop is Fontana Dam, the tallest dam east of the Rocky Mountains. The Appalachian Trail crosses the dam. You can either walk or drive across the top. Find a small visitor center, observation deck and several parking areas with gorgeous views of the dam and lake. At the Fontana Village Marina, rent a boat or take a scenic lake cruise. Read more about Fontana Dam. 23 Miles: Fontana Village was originally built as a town for the workers and their families who came from all around the country to construct the Fontana Dam for the Tennessee Valley Authority, from 1942 until 1944. Today, it's a resort with a lodge, cabin rentals, restaurants, general store, gas and plenty of outdoor activities. 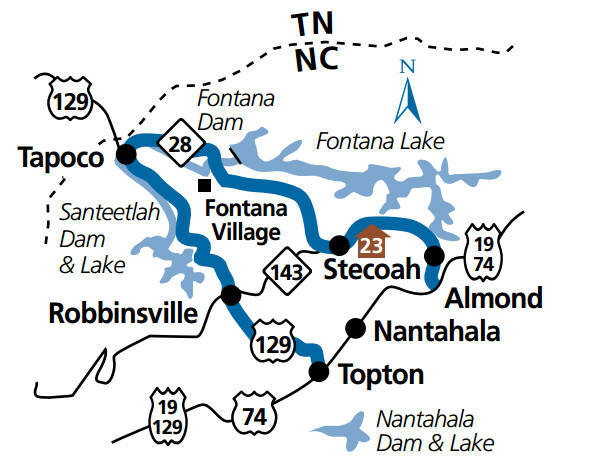 24 Miles: Take a right on Powerhouse Road for a short drive to the base of Fontana Dam. 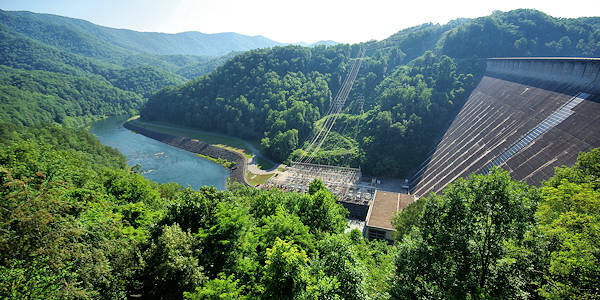 32 Miles: After leaving the dam, you'll drive inside the Great Smoky Mountains National Park along the narrow Cheoah Lake. This very scenic stretch takes you to US Highway 129 (approximately at your 32 mile mark) at the base of The Dragon, a popular, twisting section of road for motorcyclists and sports car drivers that takes you north into Tennessee. Read more. Turn left at US Highway 129 South to continue on the Indian Lakes Scenic Byway. 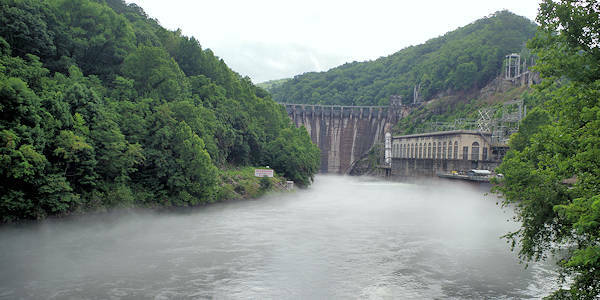 34 Miles: You'll cross a bridge with a great view of the Cheoah Dam, also known as the Fugitive Dam since Harrison Ford famously jumped from the dam in The Fugitive movie. There's room to park on the side of the road past the bridge and walkways on the bridge. 38.4 Miles: Look for a small parking area on the left for Yellow Creek Falls. 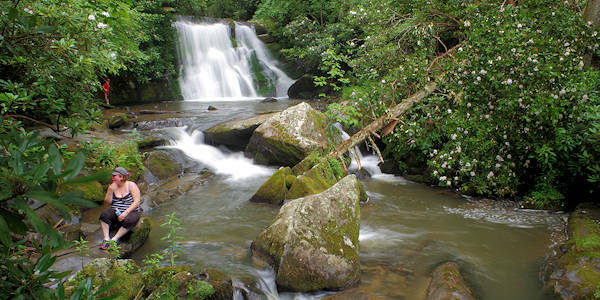 Take a short hike to see this beautiful waterfall deep in Nantahala National Forest. Read more. 41.5 Miles: Joyce Kilmer Road to the right takes you to some primitive camping spots along Santeetlah Lake and to Joyce Kilmer Memorial Park. 42.5 Miles: Take a short detour to Cheoah Point Recreation Area in the National Forest has a campground and beach for lake swimming. Santeetlah Lake is bordered by National Forest for about 80% of its shoreline. Read more about Santeetlah Lake. 44 Miles: The town of Lake Santeetlah has many second homes that are now vacation rentals. They also have a marina for boat rentals. 48 Miles: Turn right onto NC 143 to reach Joyce Kilmer Memorial Forest and the Cherohala Skyway. 49.5 Miles: Welcome to Robbinsville, the biggest small town in Graham County with 600 residents! NC Highway 143 East takes you back to the Stecoah area. Read more about Graham County. 61 Miles: US Highway 129 ends at US Highway 74 (the Nantahala Byway). 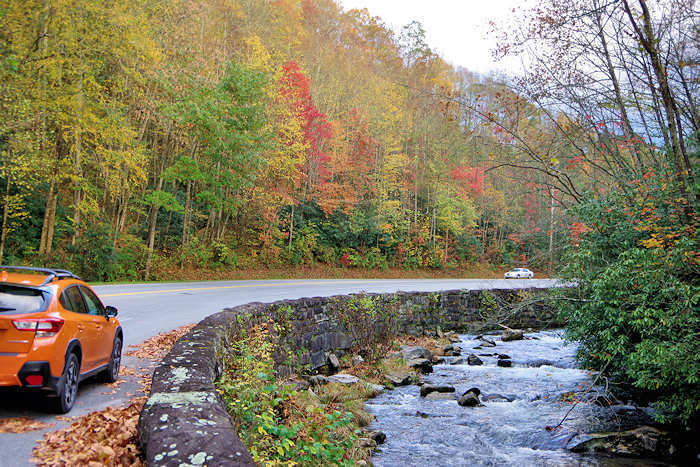 Turn left to drive US 74 East through the spectacular Nantahala Gorge, by the rushing river. Find overlooks and picnic areas along the way. 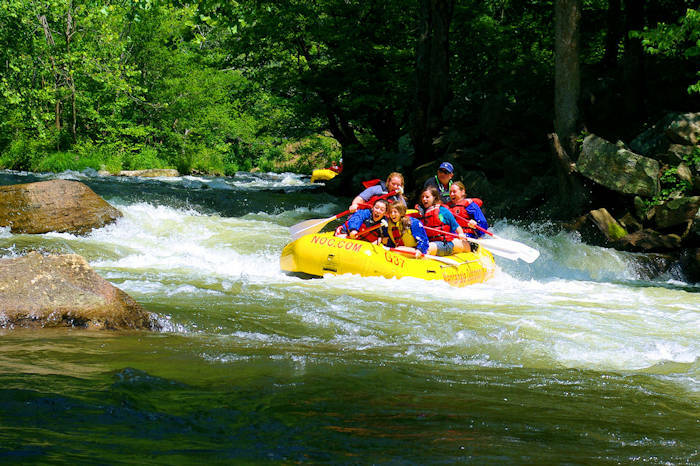 Stop at the Nantahala Outdoor Center or Wildwater for fun rafting trips and ziplines. 75 Miles: Return to your starting point at the intersection of US 74 and NC 28!